The human instinctive reaction to any given situation is often subconscious and delivered in the blink of eye, but this rapid thought process is far more meaningful than most people immediately recognise. Some people call that reaction a ‘gut feeling’ others call it ‘intuition’ or ‘instinctive’ but what is clear is that instant reaction is far more informed than we give ourselves credit for. Whatever you call that one-second feeling, it is not random, nor can it be dismissed simply a as knee jerk reaction. You can scientifically rest assured that your instantaneous reaction to a specific set of circumstances is in fact your brain delivering all of your previous experiences, condensed and executed without conscious thought, and in the blink of an eye. In other words, all of your past memories, experiences and thoughts are mashed together and given to you in that second. That is why, generally speaking, people who have been in a certain job for a very long time seem to know the right answer to a problem as soon as it is presented. The more times we experience a set of circumstances, the stronger that instinctive response becomes. As with so many things in life, repetition creates a stronger instinctive response. So to football. Lets say that you would love as a coach to develop the next Messi. The question as a football coach is then surely how can you give young players enough repetition of creativity, because true creativity comes from within? 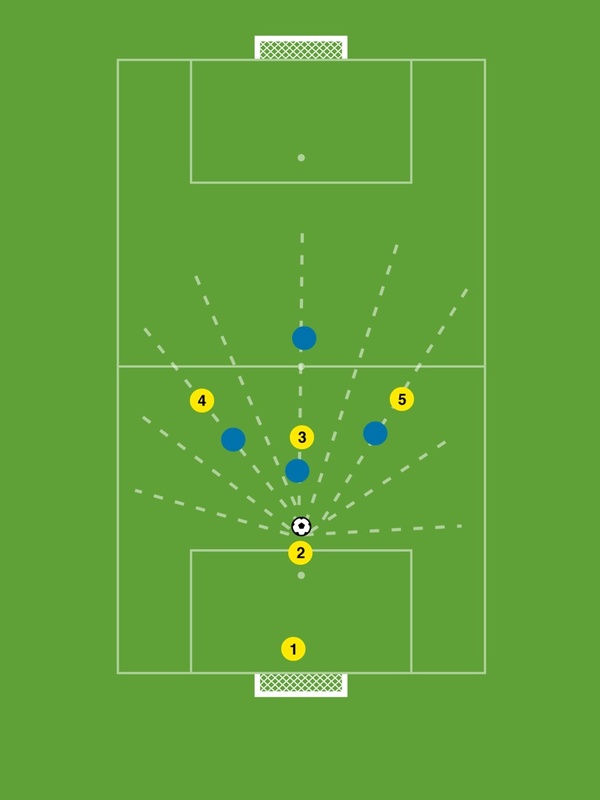 Creativity in footballing terms is perhaps seeing a through ball, or beating a man, or opening up space for you and your team. I don’t believe that creativity can be taught by a ‘do this and do that’ instruction style of coaching and the human the science would appear to agree. Creativity is trial and error, repeated. So how do we coach creativity? Creativity comes from within. I am a long way from having the answers by the way, but I do believe that a player needs to feel inspired to try new things, and at the same time feel supported that whatever they try, whether it is successful or not, will be 100% supported by their coach and parents. Only then, through repetitive creativity will that player deliver that blink-of-an-eye response in a match. We have largely lost street football in England, most worryingly because of the bad people out there who can harm our children, or more accurately the fear of those who might harm our children. When I was a kid playing for hours in the park, Jimmy Saville was doing his worst as we now know, but the danger never seemed as harsh as it does today. Every day you hear of one case to strike fear into the hearts of any parent. Forget we are a nation of nearly 65m people, and the actual chance of child abduction is statistically remote. The fear is there, and fuelled by the media. As a result, letting your kids out to play from the end of school until dusk happens less and less. The result is less unstructured ‘creative’ time with a football for our youth. Add to that to the rise in technology such as XBox, Playstation, iPad etc and we see another barrier to kids in this and many other countries playing the beautiful game. Think back to Suarez. Biting aside, he is a genius with a football. He grew up poor, and his primary means of entertainment was football in the streets with his friends. Thousands of hours built up without structure, creating new pictures and strengthening existing current pictures in his mind. I am nearly 42. I remember spending entire days as a kid playing football. Jumpers for goalposts, mates, one ball … GO! I am talking eight ours straight in the local park. When I couldn’t, I went between the houses and kicked a ball against the wall. Scoring FA Cup winners for Liverpool with half the kicks, and registering assists with the other half. I could spend hours on my own with a ball and a wall, but today kids seem to need to be entertained or else they won’t play. How many kids have that same opportunity or motivation that I grew up with in England now? How many play street football, or play unstructured football for hours on end? If you visit most parks at this time of year, you will see grass too long for a young player to machete a ball out of and precious few kids playing as a result. As a kid, we used to get to the park early so we could get the flattest expanse of park for ‘our game’. Before another group of kids took it. That is rarely a consideration anymore … wide open expanses of long grass full of nothing. Sweet FA. The picture on this article was taken four weeks ago at the park in Sutton near where I grew up. I spent hours and hours playing in this park as a kid, and thought it would be nice to take my own son back there for a kick about. The picture above illustrates what I found. Long grass. 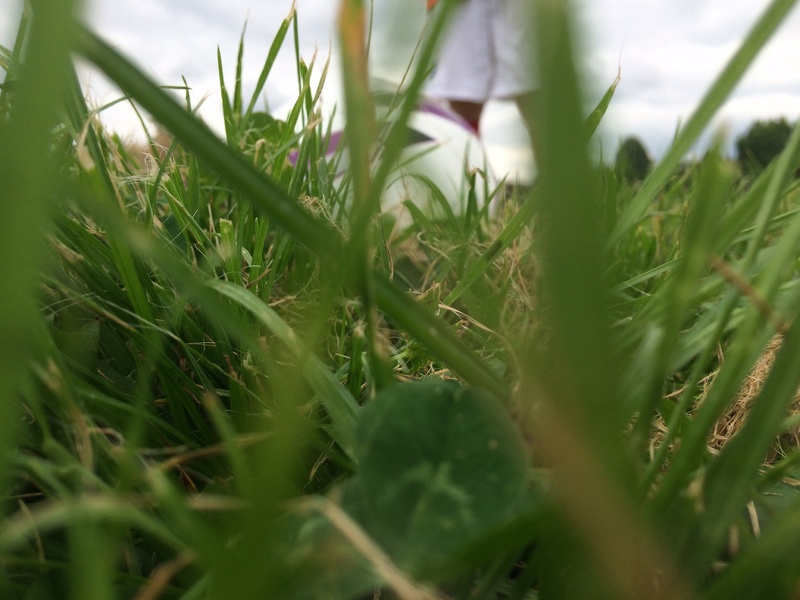 The blurred colours behind the in the above photograph grass are my 7 year old son and his football. How is a kid supposed to play football in these conditions? I went to three other parks that day in the local area and found a similar situation. Acres of grass but nowhere to play. So as we all celebrate the end of a wonderful World Cup in Brazil, and lament another poor England performance in another major tournament, we should remember that for a long time the base of the English football pyramid has been diminishing. At the bottom of that pyramid you need to have kids playing football. Today, the simple fact is that less kids play football than they did when I was growing up. For somebody who has taken so much pleasure from football for so long it is really sad to see. There are a multitude of other issues that is preventing England from being a world super-power of course, but it still seems to me that with England, Roy Hodgson is trying to fix the roof of a house that has yet to be built. Roll your eyes now at the inevitable mention of German football. Germany started from scratch a decade or so ago. They got their football association and top clubs to buy into system under the watchful eye of German legend, Jurgen Klinsmann, and they have just won a World Cup. From a young age to the international scene, players play a similar way. The German way. In England, a player under 9 will likely be at a club where the coach is either completely under-qualified or not qualified at all. Aged 9, the very best of that crop will be signed to an academy, and then that club will train those players in the Chelsea way, or the Arsenal way, however they see fit. No cohesion. No thoughts of ‘The English way’ because despite being in England, the Premiership couldn’t care less about English football. Once into a club, these young players often see lots of foreign superstars in the first team, and in some cases the reserves as well, and even if they manage a fantastic progression through the youth system that still will not guarantee them a place in the first team. They often hit a wall, and watch as the club continue buying foreign talent which is blocking their progression to the first team. Now some people will say well if they were good enough, then they would break through. I think that misses the point. They can’t become good enough if they are not given regular, competitive first team football at the highest level to help them progress. How are they supposed to be good enough to be Premiership superstars alongside Suarez, and Zola and Bergkamp if they are treated like like Ryan Bertrand, as a case in point. He is 24 years old, and went to Chelsea in 2005, aged 15. He last played for Chelsea in a year later in 2006, before going on loan to Bournemouth, Oldham, Norwich, Reading, Nottingham Forest and Aston Villa. Despite being bumped from pillar to post, he has still represented his country at every level from under 16 to full international. How is a talented player like Bertrand supposed to ‘take it to the next level’ without a chance at playing top flight football on a regular basis? Starting at the fundamental base of the footballing pyramid, we need to put parks into a state on which we are able to play football. I live in a very green area, and everywhere locally has grass that is too long for 7/8 year olds to play football on. I could barely hack the ball out of the grass on some of them. Schooling – from an early age, local non-league players could go in and address school assemblies. Or if that isn’t possible then enthusiastic FA qualified coaches.coaches. Let’s excite more kids about playing more football. Obesity and a sedentary lifestyle are real concerns for societies today, so lets not lose any more kids to a life of McDonalds and computer games. Offer safe areas where kids can just come and play whenever they fancy. Perhaps chaperoned by an FA qualified coach. Allow the ‘old school’ ethos of street football to return, by providing a safe environment to just play. It would also be a great place for local scouts to come and find their future stars. If creativity comes from within, and repetition of creativity enables players to make ‘creative decisions’ then more kids have to have the opportunity to play more football. Improve the FA qualified Coaches that are available to the grass roots game. I believe that the FA youth Award is a massive step in the right direction here, but we need more. According to the tutor I had for my FA level One course, level two is really suited for coaches who coach teams aged 12 upwards, so that means once I have completed the three modules of the Youth Award, I have few options open to me to educate myself and become a better coach for the under 8s I currently manage. If you have a UEFA A or B license, your level of education will have moved far beyond what a young player of 8 years old requires, and therefore coaches understandably move up the age groups. Why not have an entirely new coaching pathway dedicated to those coaches who feel best placed to coach 5-11 year olds then? Imagine if you could work towards the UEFA Pro License equivalent for coaching 5-11 year olds? The FA recognise this as ‘the golden age of learning’ so lets reinvest some of the billions sloshing around in the Premiership into making this golden age the best it can be for our young players. This one is at the top of the pyramid, but we need to kill the stranglehold that the Premiership has on this country. It is the worst kind or Trojan horse, because it has rolled into England with all its glitter, money and promises, yet spilled its guts all over us. It’s guts were full of win at all costs and foreign is cheaper edicts. Full of TV money and boastful claims. It was full of foreign players who are deemed to have been coached better and thus to be better technically. On top of all that these players players are often cheaper! The Trojan horse is full of ‘England has the greatest league in the world’ yet the star players are rarely eligible to play for England. We either go balls deep into this Trojan horse, and use it as an emotional crutch every time somebody mentions how woeful the next England performance is in a major tournament, or we take English football back to benefit England. This is in no way, shape or form anything the EDL should latch onto by the way. I am not calling for an end to foreign players. Genius that graced the beautiful game such as Zola, Bergkamp, and Suarez are an enormous privilege for any team in any country to enjoy. Surely though with a unified national approach in England, that doesn’t pander to the money and power of the Premiership, we can replace players like Kvarme, Djemba-Djemba and Boogers with English players? The latter was allegedly signed by West Ham United without Harry Redknapp ever seeing him play! A coach mentioned to me last night that he expected the CPD courses that we will attend next year to be full of ‘German learnings’ and while on the face of it that might make sense off the back of their recent success, we have no chance while items 1-5 above are so woefully wrong. Just my thoughts. Be really interested to here what you personally agree and disagree with?